CT View of the BioZorb marker in extreme medial location: a challenging position to target the AccuBoost dose. Q: Do you find the BioZorb markers beneficial for targeting the AccuBoost dose? dimensional BioZorb markers are a step in the right direction to better pinpoint the tumor bed. The question that I have pondered is the relative benefits of the product compared to surgical clips. Until recently, I was not necessarily convinced. In recent months I have seen cases that if BioZorb markers were not sutured in place, it may have been difficult to correctly identify the target and would have caused excluding the patient for treatment. 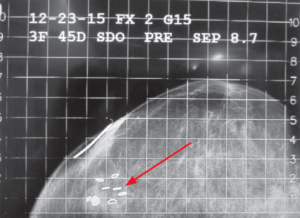 C-C image of the same patient with AccuBoost targeting coordinates identified and applicator marked. Q: Can you describe one of these cases? A: There was a case, where the tumor bed was in the extreme medial portion of the breast. Usually, this location presents a challenge to target with AccuBoost. I suspect that many AccuBoost users wouldn’t even make the effort to treat such a patient. Fortunately, the surgeon had placed a BioZorb marker in the patient. Q: Can you illustrate some of the specifics? 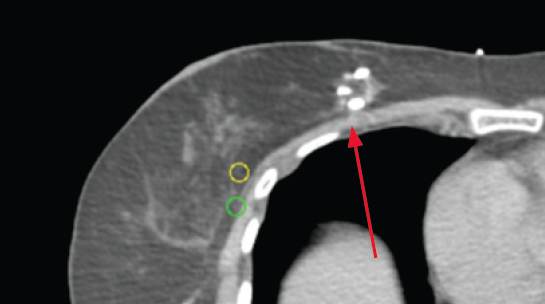 A: The location of BioZorb as seen on the planning CT (on left) shows the proximity of the marker to the chest wall – a challenging location for AccuBoost. To my pleasant surprise, when the patient was placed in the mammography system, the BioZorb marker readily separated from the chest wall. The marker was easily imaged on both axes and we were confident to proceed with the AccuBoost treatment. A consequence of this observation, I am revising my view that extreme medial location of a tumor bed is no longer, necessarily, a difficult anatomical location for targeting AccuBoost. To download the entire newsletter, please click here.